Long established Eatery, wing destination and home of James Squire beverages; O’Connell Streets The Curious Squire has a new chef and a updated Louisiana inspired menu. The Yoder Smoker is still there producing succulent port and rib dishes, but Chef Joshua Barry has set out to modernise and the menu with subtle technique and flavour changes. Adelaide Food Central was invited to the menu launch and here are some of our favourites. Buffalo Wings at the Curious Squire are not new to me, I have been going to their Wing Wednesdays for years. Serving 400kg of wings each week they’ve got their winging down to a fine art. I’m told that the Squire is the only place that cooks the wing in the deep fryer from raw to finish. The buffalo hot sauce is house made, the Squires own recipe. They serve their wings with a buttermilk ranch dressing which saddens me slightly. 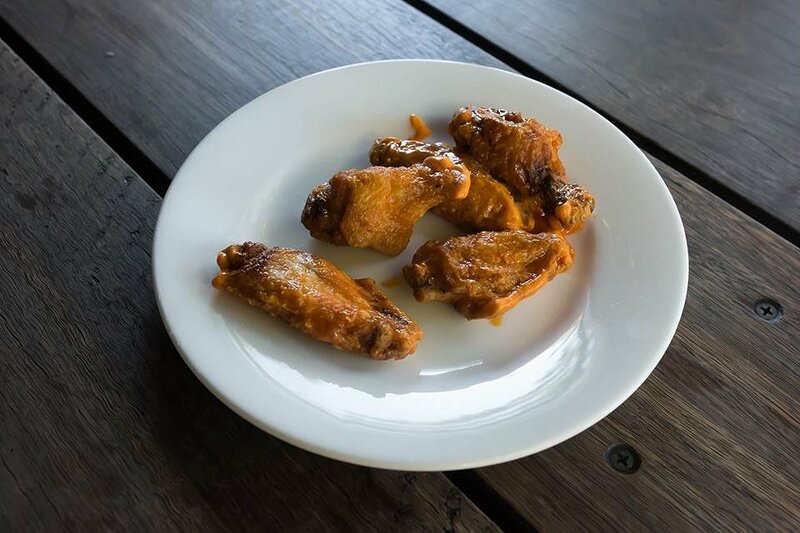 I am a traditionalist with wings and I feel that a blue cheese is a better match than ranch. I have a new addiction in the Mac’n’Cheese Balls. The American classic dish has been given an Italian Arancini ball inspired makeover. 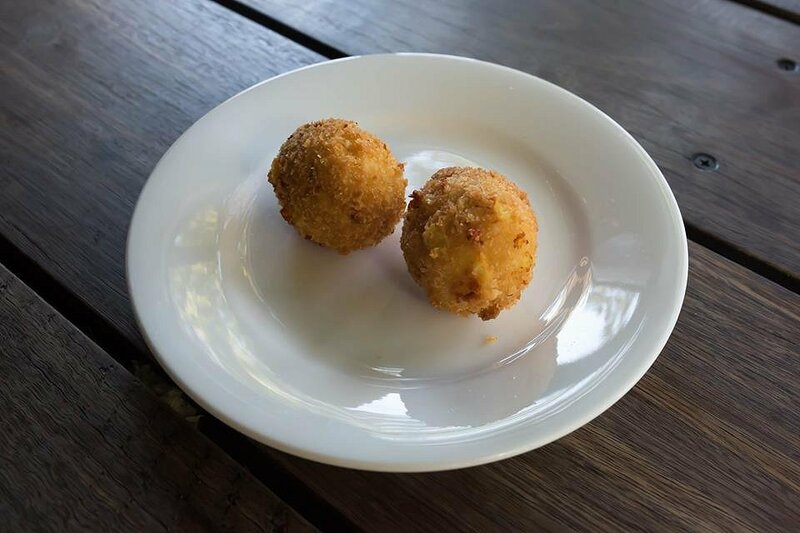 The moreish balls have a crunchy fried breadcrumb crust that gives way to a delicious cheesy centre. I think it’s important appreciate the technical cooking skills that go into these cheesy delights. First after a process of trial and error the sauce was developed as a 50/50 mix of béchamel and mornay. They spend 2 days setting in the fridge before being rolled and crumbed in the fridge as they will dissolve at room temperature. I hope this gives you an idea how delectable the inside is. Remember that scene from Seinfeld when Newman runs down the street gleefully chanting for Jambalaya. You’ll want to do that too when you’ve tasted the Squires’s delicious Jambalaya. The rice dish reminiscent of paella, risotto or a biryani, is a traditional dish of Louisiana. Full of chicken, Texan smoked sausage and huge Spencer Gulf prawns, the rice is cooked in a spicy tomato based sofrito and chicken broth. The al dente rice, was tasty, well-seasoned and had a lemony zing and a nice chilli heat. Continuing the Southern American inspiration we dive into a plate of Slow-Cooked Pulled Pork. Because the has been slow cooked with the bones in the final product is very finely shredded due to the bone removal process – the kitchen carefully ensuring every trace of bone has been removed. The BBQ sweet sauce is tangy and a rich dark caramel flavour. For me it was a little too sweet, it tasted almost candied, but texturally it was superb. The pork is served with pickled onion which counters the sweetness, chips and coleslaw. The 12 Hour Smoked American Pork Ribs had delectable, succulent meat that fell from the bone. The smoky BBQ flavour did not overpower the delicious pork and they were not as sweet as the pulled pork. Aside from the Louisiana inspired mains the Squire Menu boasts a tempting burger section. 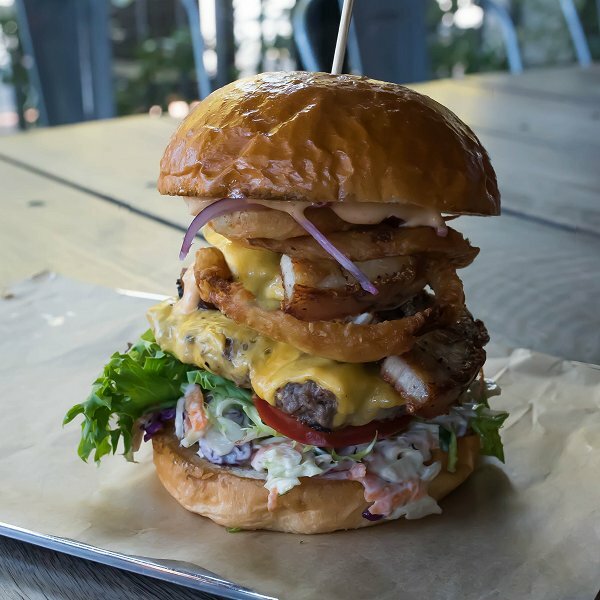 We tried The Curious Burger, a mouth-watering indulgence of a beef patty, crispy pork belly, American cheddar cheese, coleslaw, tomato, pickles, lettuce, crispy onion rings and squire sauce. It is a tower of a burger; perhaps the “curious” part is how to fit it in your mouth? Once you work out a way – it’s totally worth it. The cheese has been lovingly melted onto the beef patty, which is a 100% Angus Beef mix of scotch fillet, topside, chuck and brisket. The pickles are generous and the salad fresh and crispy. The addition of a fried onion ring and luscious pork belly top off what really is a fabulous burger. 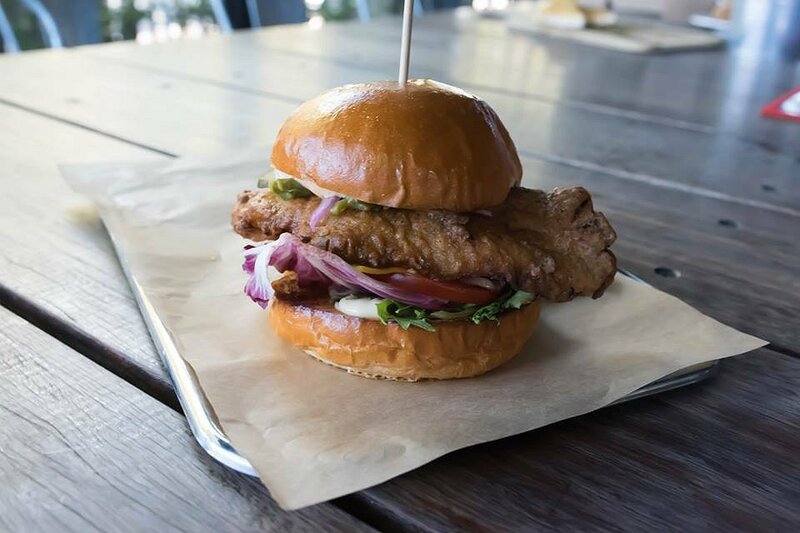 For those who prefer a Chicken Burger the aptly named Mother Clucker is guaranteed to hit the spot. The chicken breast is super crispy as a result of the soda water used to aerate the batter. I love the pairing of avocado and cheese and the guacamole in this burger works a treat with American cheddar cheese, bacon, lettuce, tomato, onion pickles and a drizzle of chipotle mayonnaise. 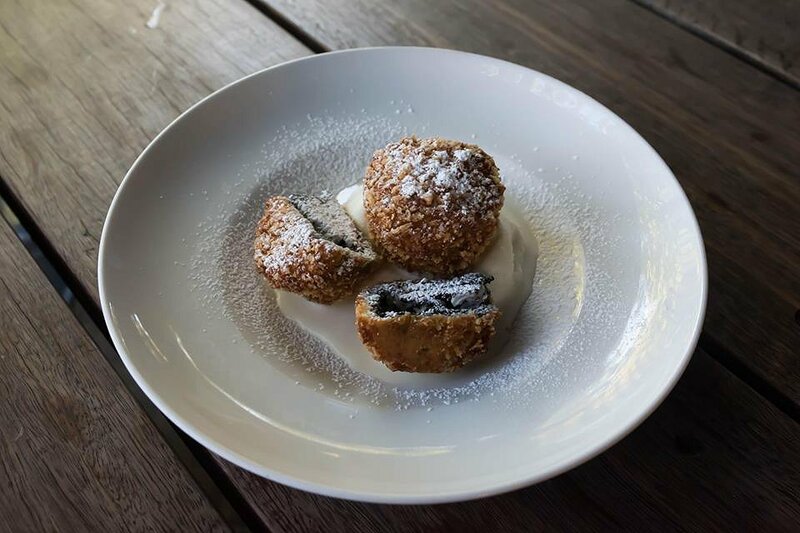 To finish it’s hard to go past the Deep-Fried Oreos Stack. 3 Oreo biscuits stacked together and bound with a maple pancake batter, crumbed and deep fried. The maple flavour is strong and the outside crumb is golden and crunchy. Served with vanilla ice-cream it’s a very indulgent way to complete a meal. I’m thrilled with the direction that Chef Barry has taken the new menu. The old favourites are still there, some improved and other’s just as they have always been. The extra attention to detail is showing up in the finished products having a little more flair and a whole lot of flavour. If you need someone to proofread your posts before publishing please let me know! I’ve spotted a few spelling and grammatical errors in the first paragraph.